A proposed plan created by DCPS and JSO officers is recommending staffing every elementary school with an "armed school safety assistant." JACKSONVILLE, Fla. - The Duval County School Board voted to move forward with a plan that'll hire over one hundred school safety guardians for Duval County elementary schools. In the wake of the Parkland school shooting tragedy, new legislation gives schools options to fulfill the requirement to put safety officers in every school. Board members said Tuesday they grappled with complying with the new legislation and affording quality protection for elementary students. The school safety assistants will not be sworn officers or have arrest powers. The position requires individuals undergo 160 hours of training from JSO and the Duval Schools Police Department. Training will include firearms qualification and candidates will be required to requalify on firearms training each year. The starting pay for the position will be $12.50 an hour, $20,600 annually for the school year. VOTE: Do you support paying higher taxes for armed officers in every school? DCPS middle and high schools are currently patrolled by sworn school resource and school safety officers. According to DCPS, hiring sworn officers who have completed the police academy to patrol elementary schools would cost over $10 million. The plan to hire safety assistants instead will cost $4 million. Interim superintendent Patricia Willis said other school districts, like Clay County's, told her they are considering raising the millage tax rate to afford sworn officers. 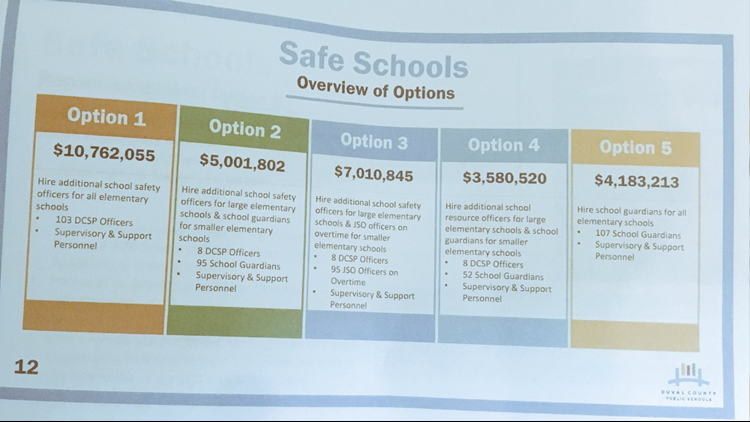 Even with the lower cost option, the $4 million price tag on 107 safety assistants exceeds DCPS' budget, according to Willis. To make the plan work, DCPS said state Safe School funding will not be enough. The district received $3.6 million in state funds and an additional $800,000 will be needed from DCPS' budget to fully fund the new initiative. Parent Tim Miller voiced concerns other programs like exceptional student education (ESE) may suffer due to the new plan. "I know a lot of things would have to be cut or scaled back, and there are a lot of good programs but we have to focus on the core function of the school," Miller said. "ESE is a core function of a school that is too many times pushed off to the side."